Sometimes, recovering a lost dog is as easy as driving down to the local shelter or posting a LOST DOG Ad on Craig’s List. However, when the dog has a skittish temperament and is so panicked that he is running from everyone, including his own family, things change. Suddenly it’s not so easy. In fact, it can be downright hopeless. Many of skittish dogs that escape from their families are simply never recovered because theses guardian typically don’t have the knowledge, the proper equipment, or the support they need. The story of Bill is case where a family (a foster family at that) refused to give up, even when the recovery took them close to one year! Well, as fate would have it, an adoptive family was found for Bill. However, there was a problem. Bill hated crates. 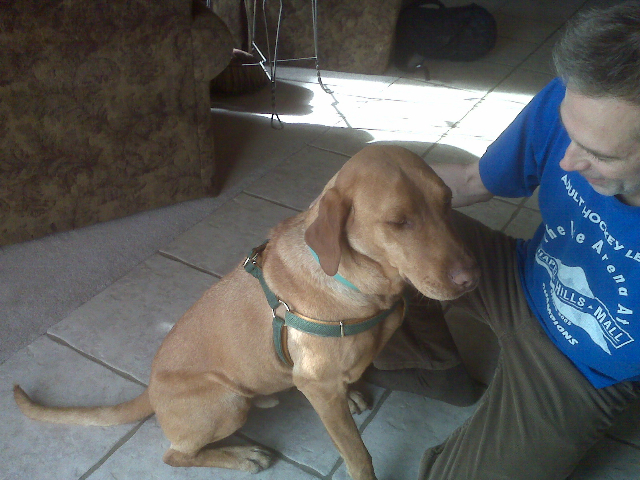 But the rescue group felt that Bill needed to be crate trained for his new family. So Bill was moved out of the Blackwell’s house and in with another volunteer who knew how to crate train dogs. As Marianne told me, “With a great deal of sadness, we let them take Bill from our home. We were miserable.” Marianne and Don were miserable because they loved Bill and knew how much this gentle dog hate, hate, HATED crates! When Marianne called the fellow rescuer a few weeks later to find out how Bill was doing, she learned the crushing news. Bill had jumped a fence and ran away from the other rescuers house a week before. Marianne and Don were heartsick! They immediately launched an extensive search (shelter checks, posters, advertisements, etc.) for Bill. They kept this up not just for weeks, but for MONTHS. However, eventually all leads and sightings diminished down to nothing. It seemed that Bill had vanished from the face of earth. Then, eight months later (in January 2011), Bill was sighted by the same rescuer he’d escaped from. He was seen running near a drainage ditch not far from his home. Marianne and Don jumped back into recovery mode. They posted more flyers, talked to people in the area of the sighting, and ultimately after great gumshoe work they discovered where Bill was living. 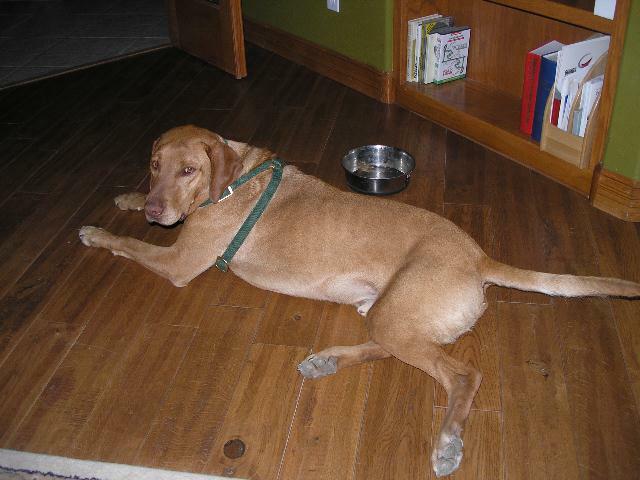 He had found an abandoned house with a hole big enough for a Viszla mix to crawl into. Don and Marianne began to put food out there and would catch glimpses of Bill as he took off in terror from anyone who tried to approach him. 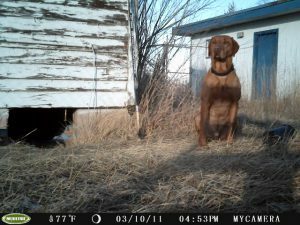 I immediately advised Marianne to purchase a digital wildlife camera in order to monitor Bill’s activity, especially if they planned to use a large dog humane trap (which I also recommended they get). I then referred her to Jim Branson, Missing Pet Partnership’s secret weapon for recovering hard-to-catch dogs. Jim consulted with Marianne (then and over the next several weeks), sharing MPP’s experience in using humane traps, wildlife cameras, and the very rare cases where traditional trapping did not work and other techniques were needed. Marianne and Don bought a wildlife camera and set it up by the food dish. Immediately, they began to monitor Bill’s activity by looking at the pictures that were snapped of him every day. 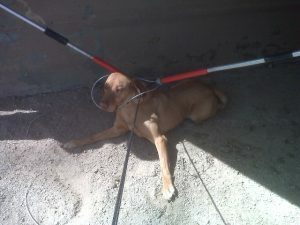 They contacted the Larimer County Humane Society Animal Control who set up a humane dog trap. However, Bill would not go into the trap. So they put out the largest size dog trap available but just like Sophie who was just too afraid to enter a dog trap, Bill would not go into a dog trap. 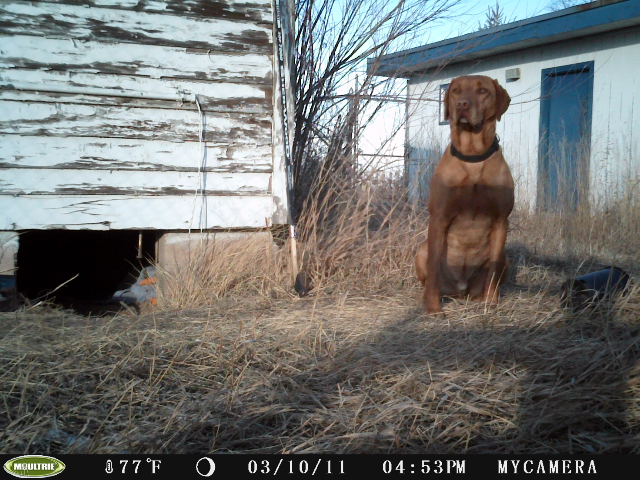 This is the value of using wildlife cameras in capturing skittish dogs and cats. Wildlife cameras provide useful information. They confirm that the animal is still in the area. 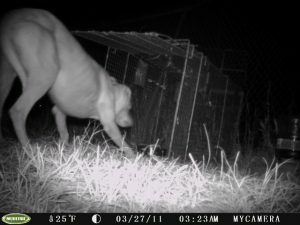 And like the case of the skittish dog Vivian Irene and Buddy the skittish cat, wildlife cameras can inform rescuers that yeah, a baited humane trap IS attracting the animal you’re trying to catch but the trap ISN’T going to catch them! And that’s what happened with Bill. Don and Marianne spent the next several weeks trying to catch Bill. 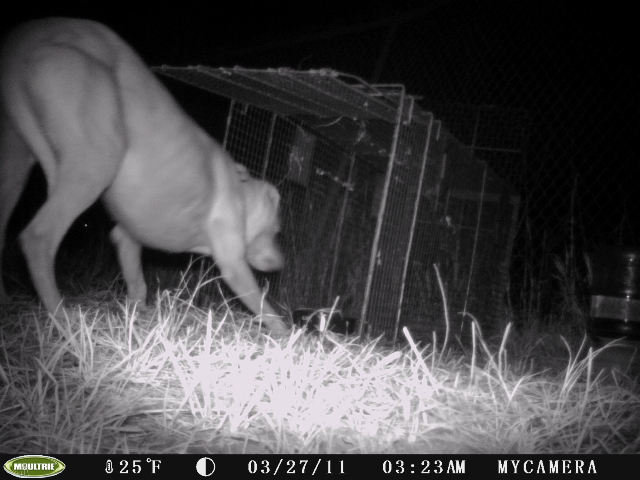 They put a sedative in his food, thinking it would make him calm enough to enter the trap. That didn’t work. Ultimately, after 8 weeks of effort they decided they needed a new plan. They contacted the Larimer County Humane Society Animal Control again and they offered to dart and capture Bill. It took a team of three animal control officers plus Don and Marianne who knew where Bill would run (which he did) after he was darted. Ultimately after a dart, a foot chase, another dart, another foot chase, and a THIRD dart (because darted dogs will run!) they were able to corner the groggy Bill and capture him with catch poles. 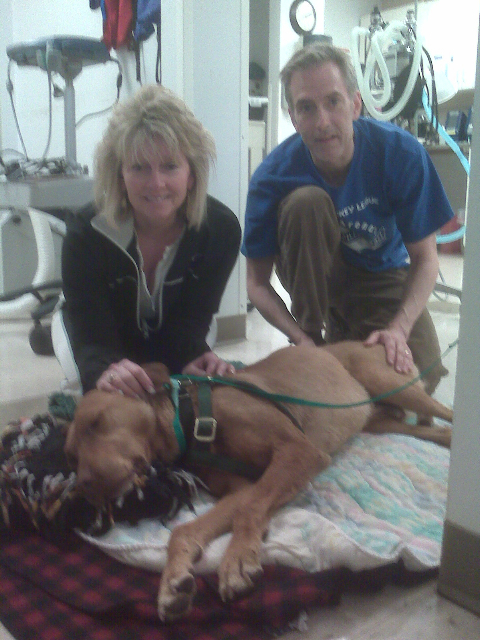 Bill was immediately transported to the emergency vet where he was given a thorough check up and a bath. He was de-wormed, given flea and tick treatment, and had blood work done for heart worm and internal organ testing. Amazingly, Bill was pretty healthy. Bill and Don: Together, Forever!